Gabriel’s birthday was a week ago, so it was his turn to pick a theme for Alexia’s nails. One of his favorite Disney cartoon movies is WALL•E. So here’s what Alexia did! Ring finger – WALL•E, represented by his E logo. A base of Revlon in Revlon Red, with a white E using OPI in Alpine Snow. Rest of fingers – EVE. A base of OPI on Alpine Snow, then FingerPaint in Black Expressionism for her face, and Orly in Skinny Dip for her eyes. Want Alexia to do a look inspired by your favorite Disney cartoon? 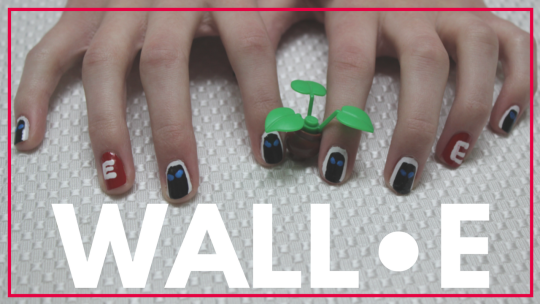 Tell us what it is, and she’ll use it for a future mani!